The first Saturday of 2014 was a big day in Gaithersburg, Maryland, the town that I call home. It was the long-awaited grand opening of the Gaithersburg Library, closed these four years for major renovation and expansion. 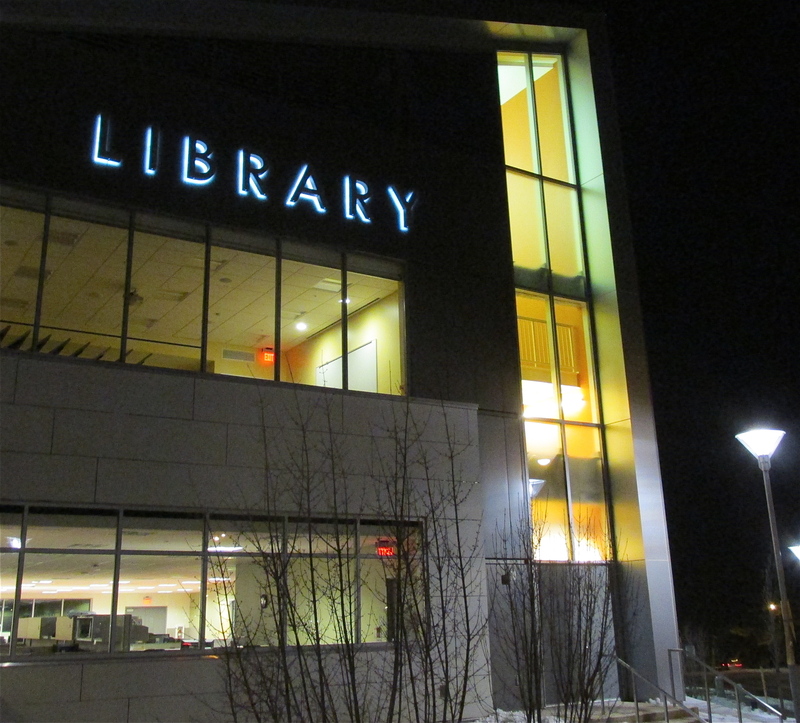 That simple, brightly lighted sign, LIBRARY, is a beacon on a winter night. The library, to me, is a symbol of human knowledge and learning. As long as that light keeps shining, you know human civilization is alive and well. This is a dark time of the year. The excitement of the holidays is over, the world has turned bitter cold. Across the northern U.S., and in Canada and Great Britain, too, all varieties of mean winter weather are on the attack. The bright lights of Christmas and Hanukkah speak to the greatness and goodness of the human spirit. Houses of worship reflect the religious and spiritual nature of humanity, indomitable through thousands of years, in spite of persecution, prejudice and evil. As long as those lights keep shining, you know human civilization is alive and well. 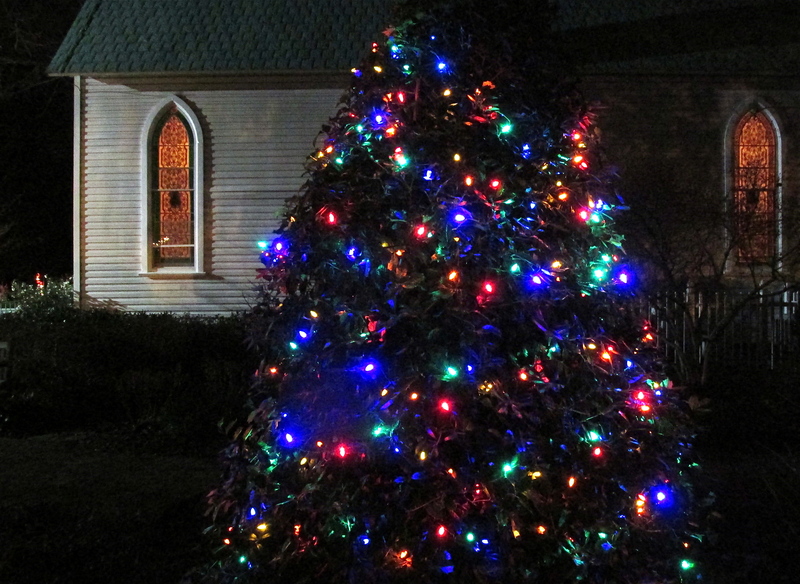 Above, a Christmas tree in front of stained-glass windows at St. Rose of Lima Catholic Church in Gaithersburg, MD. I think we need both the light of knowledge and learning AND the light of greatness and goodness. Long live separation of Church and State. I’m in favor of it. In their separate spheres of influence — religious and secular — they’re pillars of human civilization. As long as the secular lights of knowledge and learning shine, and the spiritual lights of greatness and goodness shine, HOPE lives in the world. One last thing before I close for the night. Does the title of this post sound vaguely familiar? “Don’t Let The Light Go Out?” It should. It’s part of the chorus to one of my favorite Peter, Paul and Mary songs. Enjoy and be inspired. Don’t let the light go out, don’t let the hope go out. This entry was posted in Life, Music I can relate to and tagged Christmas, Church, Church and state, Gaithersburg, Hope, Library, Light, Peter Paul And Mary, Secular, Winter by Editor (Retired). Bookmark the permalink. Ah, now that’s the kind of feedback I need! Thanks. So glad to hear about the Gaithersburg library, we have been without our library in Olney for a few years now also due to remodeling and apparently money running short. But there is a light at the end of the tunnel, it will reopen this spring. I was just commenting the other day that I am looking forward to the reopening, I hadn’t realized how much I missed it! A bright spot in every community! Thanks Eileen! We really need to count our blessings here in Montgomery County, when it comes to libraries. Few places have the money, or the support for libraries, to build these big, beautiful, state-of-the-art libraries that we have in all parts of MoCo. Libraries are often the easiest targets for budget cuts in hard times. Fortunately, we’ve weathered the worst of the recent Great Recession locally, and MoCo is going back to fully funding libraries.